The Cutlass is our new cutting edge distance driver. 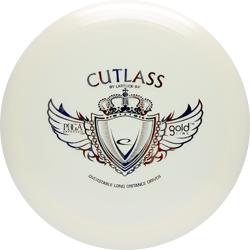 With good speed, good glide and a predictable fade it will be a sharp weapon on the disc golf course. For beginners it will be very overstable thus a great disc to fight the wind. For players with more arm speed this disc will be a fast, stable and trustworthy driver – an anchor in any disc golf bag.